We never thought is would take four stops to get through Nebraska! 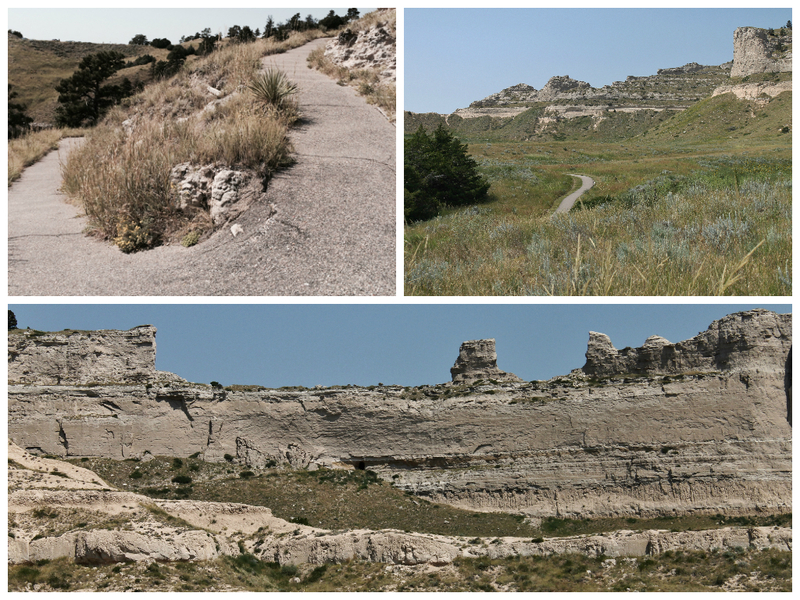 We arrived in Gering, home of Scott's Bluff on August 20th. An uneventful drive - thank goodness. We passed some beautiful scenery on our way, including a peek at Chimney Rock. We stayed at the Robindoux RV Park. 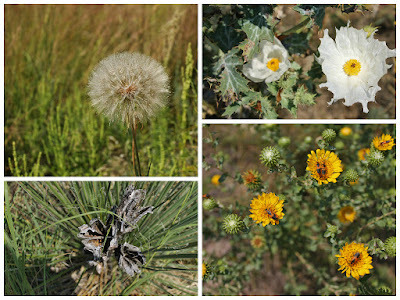 They have around 50 sites, and the grounds are very well maintained. The sites are a good size so you are not right on top of your neighbor, and it is not close to the expressway so nice and quiet. The laundry room and bathrooms were very clean and we had a great view of Scott's Bluff. We are now in Mountain time so we gained an hour on this trip which put us in even earlier than normal, so we were able to go out and explore our first day here. Gering is a pretty good sized town, but most of the shopping places are just north in Scott's Bluff (the town - not the mountain) which is only minutes away. 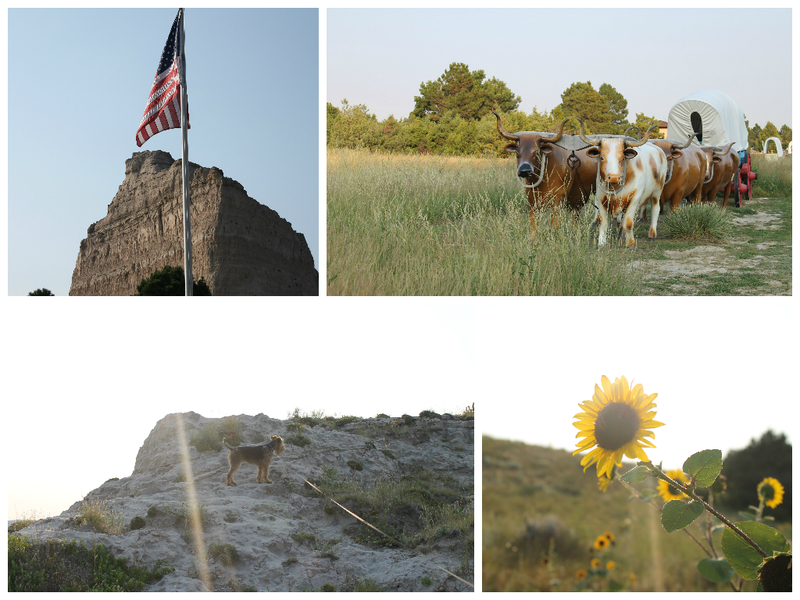 We loved exploring Scott's Bluff (the mountain - not the town). We drove through it on the first day and stopped at the overlooks and the Visitor Center, which is full of displays and information. The view from every turn was breathtaking, even with the Montana smoke hanging in the distance. Then the next day we hiked the trail that takes you from the Visitor Center to the top overlook. The hike is 3.2 miles round trip. Going up of course was harder than the down trip, portions of the trail are pretty steep, this is when Nancy decides to stop and take some pictures. She took a lot of pictures! It was hard to narrow it down to the large amount posted here. It was 93 degrees that day and it was a struggle at times - but we made it! 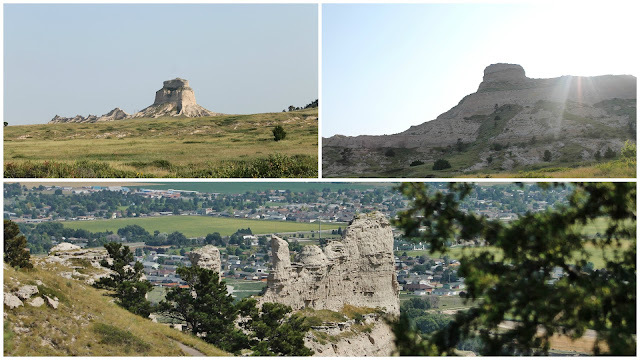 Chimney Rock National Park is just south of Bayard, NE and we first spotted it while driving to Gering. 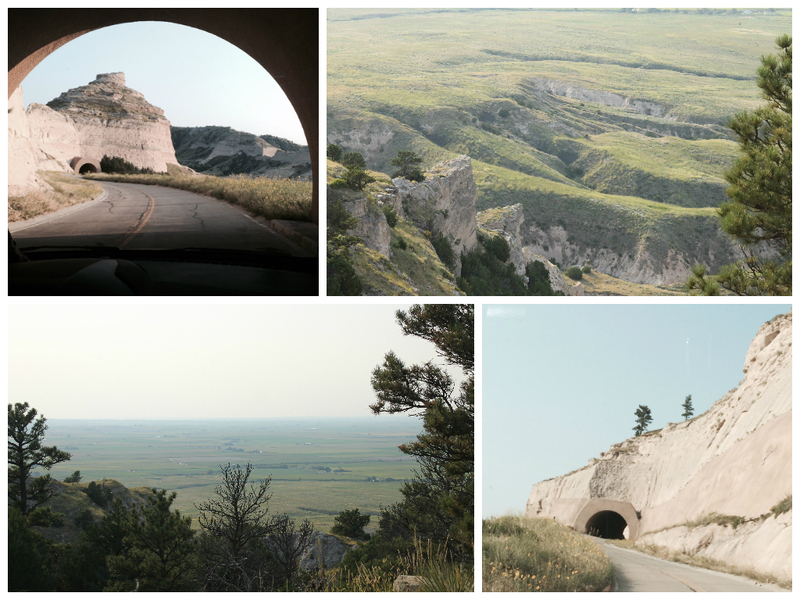 It can be seen for miles, and was used as a guide by trappers and traders as they traveled between the Rockies and the Missouri River. There is a Visitor Center that has a pictorial history of the area and a video presentation, a nice gift shop and a patio for taking pictures. The center is surrounded by open fields and there are signs every where warning of rattle snakes so there was no venturing off the sidewalk! Courthouse and Jail Rocks are south of Bridgeport, NE. You can see them for miles as you are heading south on Hwy 88. You travel down a narrow and rough dirt road but a beautiful view awaits you at the end. The road has a circular ending and while Nancy was walking around trying to find the best spot for pictures she found a couple dozen shell casings from a 22, so must be a good spot for target practice as well. Wonder what art project those will find themselves in? Les and Mielikki once again waiting on Nancy to take pictures. We have always wanted to go to Stonehenge, and seeing we haven't done that yet we thought the next best thing was to go to Alliance and see Carhenge. This place is pretty darn cool. 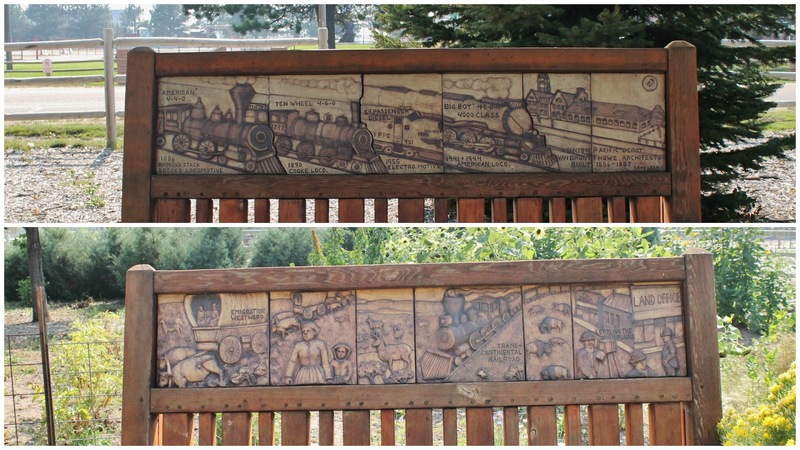 The artist, Jim Reinders, has experimented with unusual and interesting artistic creations his whole life. He lived in England for a time and studied the design and purpose of Stonehenge. 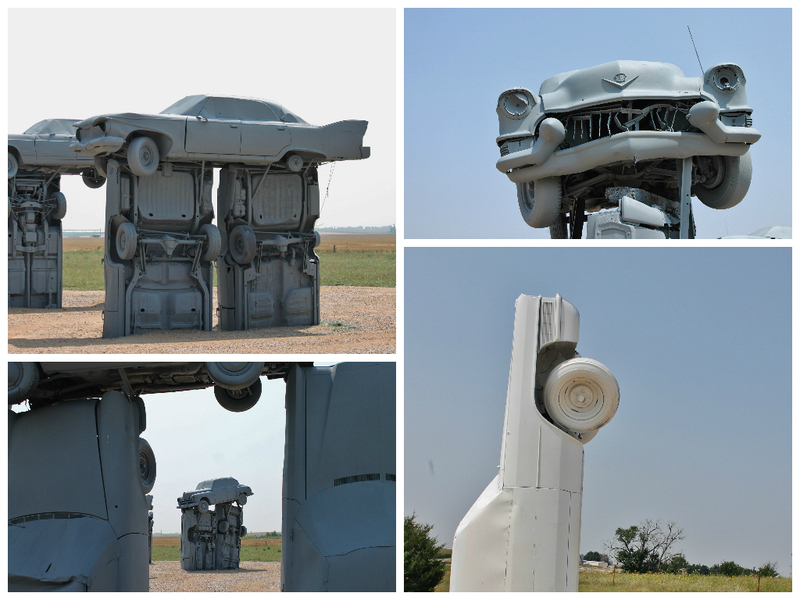 Carhenge was built as a memorial to Reinders' father who once lived on the farm where Carhenge now stands. While relatives were gathered following his death in 1982, they discussed a memorial and the idea of a Stonehenge replica was developed. They agreed to gather in five years and build it. About 35 family members met in June of 1987 and went to work. The dedication was held on the Summer Solstice in 1987 with champagne, poetry, songs, and a play written by the family. Thirty-eight automobiles are used to assume the same proportions as Stonehenge with the circle measuring about 96 feet in diameter. Some of the autos are held upright in pits five feet deep, the ones placed to hold the arches have been welded together. The honor of the heel stone goes to a 1962 Caddy. There is a visitor center called "The Pit Stop" and it has a gift and snack shop. 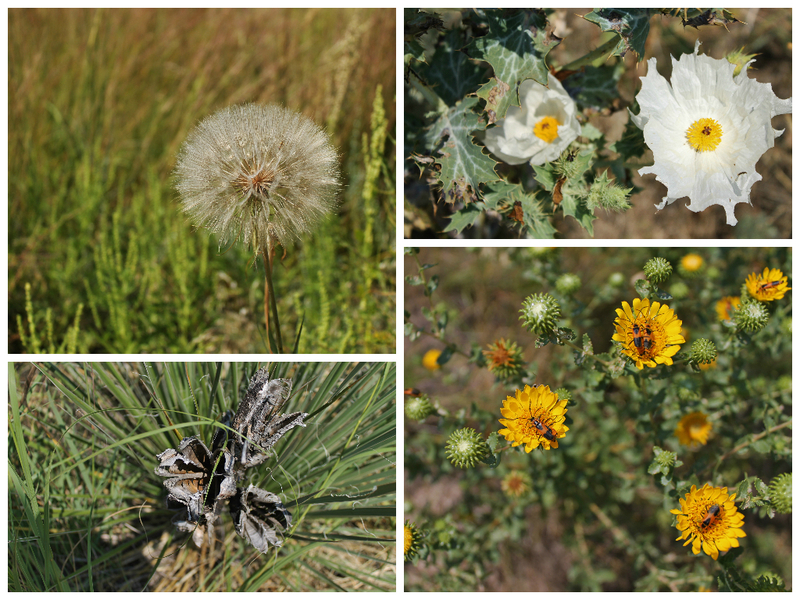 "Fourd Season" was created by Reinders' and comprised only of Fords. It was inspired by Vivaldi's Four Season's, and suggests the Nebraska landscape's seasonal changes as wheat is planted, grows, matures, and then the fields are covered in snow. The three bells represent the three Reinders siblings. 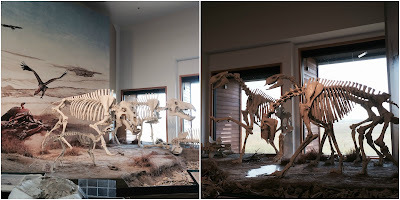 The Agate Fossil Beds are about 30 miles north of Mitchell, SD and it the middle of nowhere. They were not quite as cool as the Ashfall Fossil Beds that we visited while in Eastern Nebraska, but it was interesting. There is a Visitor Center that has a display of fossils and a small book store. There is also a large display of American Indian Artifacts from the James H Cook collection. 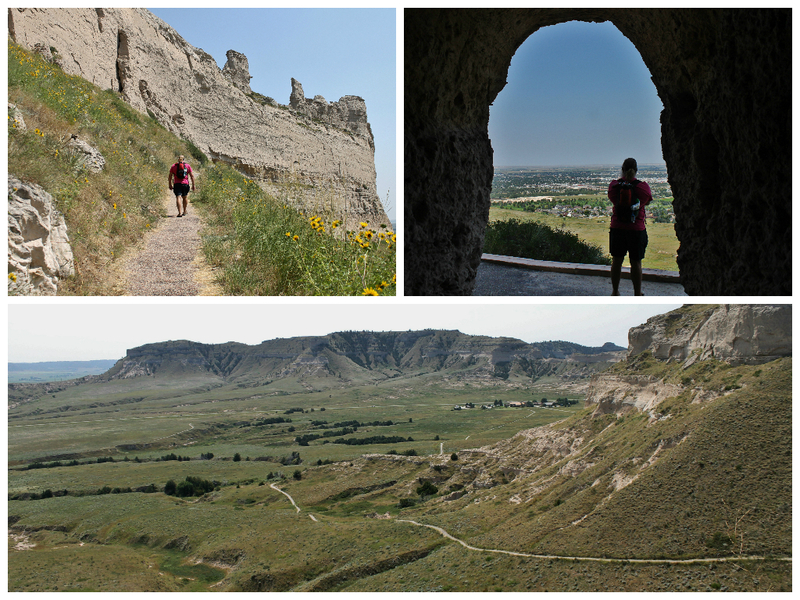 He was a frontiersman, hunter and scout before he settled on the Niobrara River. 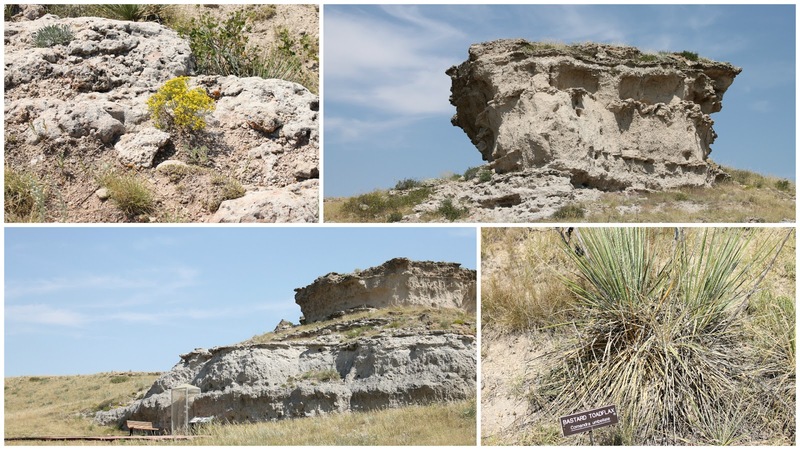 The property that the fossil beds are on belonged to him. He became a good friend of the Indians and held many gatherings at his ranch. 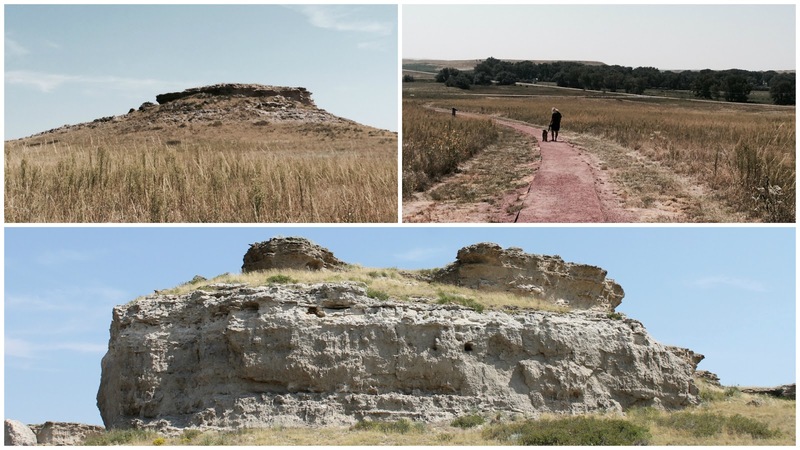 He helped to establish relationships between the Lakota tribe and the professors who came to dig the fossils. There are two trails, the Fossil Hills Trail is 2.7 miles. The other is the Daemonelix Trail or Devil's Corkscrew and it is a 1 mile loop. Seeing it was 94 degrees that day we chose the 1-mile loop. The preserved corkscrew fossils were pretty amazing. They were made by the ancient Paleocastor. Anatomically they are related to modern beavers, but they behaved more like modern prairie dogs and created spiral burrows with nesting areas at the end of them. We ventured into Wyoming one day and visited Cheyenne. The closer we got to the Wyoming boarder the worse the smoke was from the Montana fires. Visibility was down to about 10 miles, which may not seem bad but when you can usually see out across the prairie 20 to 30 miles it is a big difference. We stopped at the Visitor Center and were very impressed. They had some amazing displays and some that were interactive. Nancy was acting up again and ended up in jail. We found a Big Boy Freight Train in Holiday Park. They also have a really neat fence around the basketball courts. 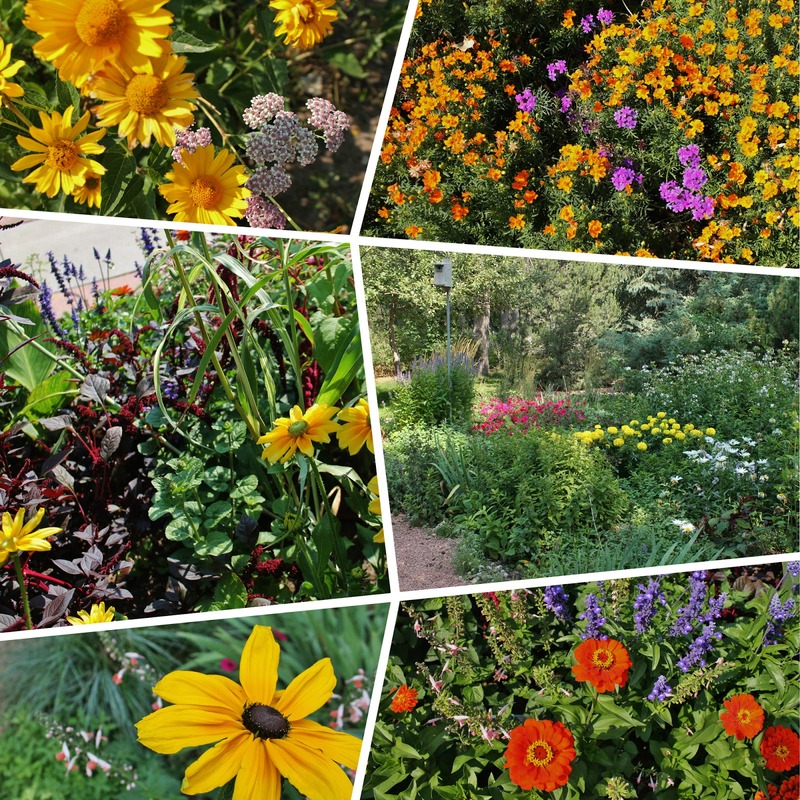 There is a small Botanical Gardens in Lions Park on Sloan Lake. Some of it was under construction, but the parts we could get to were very nice. 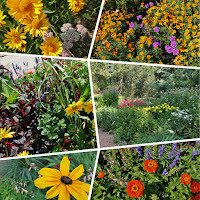 We loved that the flower beds had a real mix of flowers and colors all planted together. There is a tranquil water fall and goldfish pond with a happy purple bridge over it. The labyrinth with decorative grasses planted between the paths and lavender around the edges was very inviting. The stone benches have a labyrinth design carved into them. As you stroll through a pretty archway you discover a very beautiful walkway with quotes in each block. 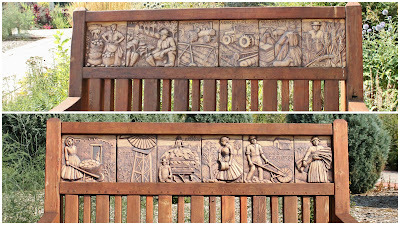 In another section of the park we discovered beautiful wooden benches with a history story carved into the backs of them. There were statues among the plants. 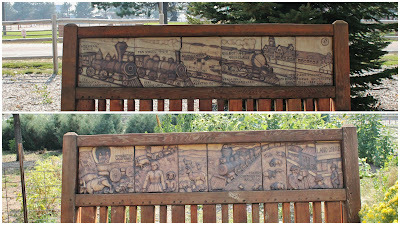 While wandering this path we came across another train. This one was surround by a very interesting fence created by Floyd and Edna Young. Nancy loved the story of the fence because it shows that there is hope for all the junk she has collected off the road! The park is a beautiful place for a wedding as well. Freedom's Edge Brewery in historic Cheyenne was a nice little break from our sightseeing. They have been in business for three years and it reminded us of some of our favorite places in Asheville. While driving back to South Dakota, Nancy was once again reminded how much of a city girl she really is. The miles and miles of prairies and fields were just about driving her crazy. We spent a morning enjoying the animals at the Riverside Discovery Center in Scott's Bluff. 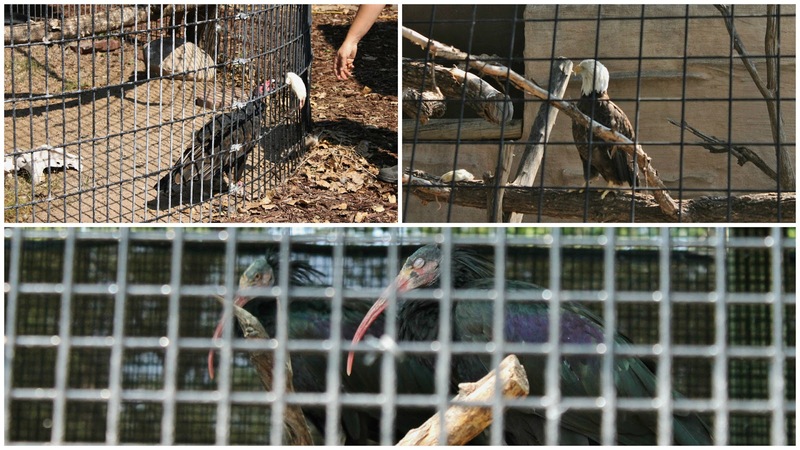 We were able to use our membership at the Western North Carolina Nature Center to get 50% off our admission. 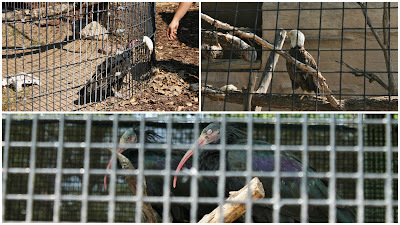 All of the birds are rescues that were injured in nature and some of the other animals were as well. 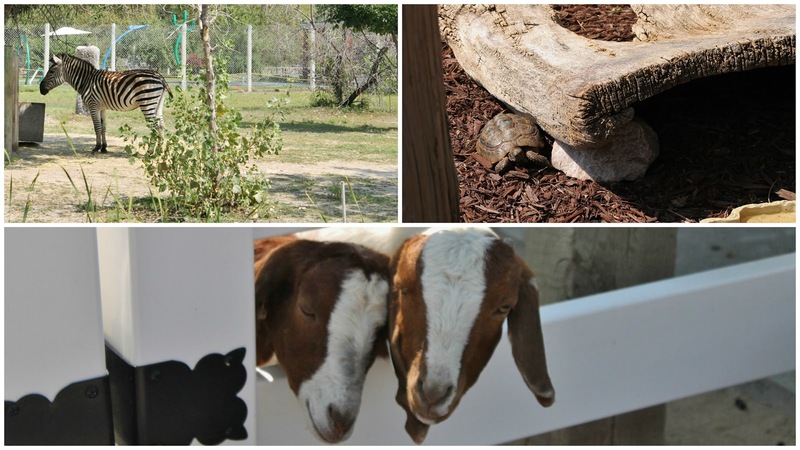 They have a petting zoo and a number of other kid friendly attractions. One of those is the dino dig, a large area filled with small pieces of rubber with various fake bones buried in it. The rubber is a great idea, no sand in your clothing. Peacocks were every where, Nancy made the mistake of throwing some feed out to one and ended up hiding behind Les to get away from it. The cutie sitting on top of the sloth is a Golden Headed Lion Tamarin. He would run into this box and poke and slap at the sloth and then run out again. After a few times of this the sloth would raise its arm and the Tamarin would run away. There is a large pond with huge goldfish and catfish as well as ducks and swans. 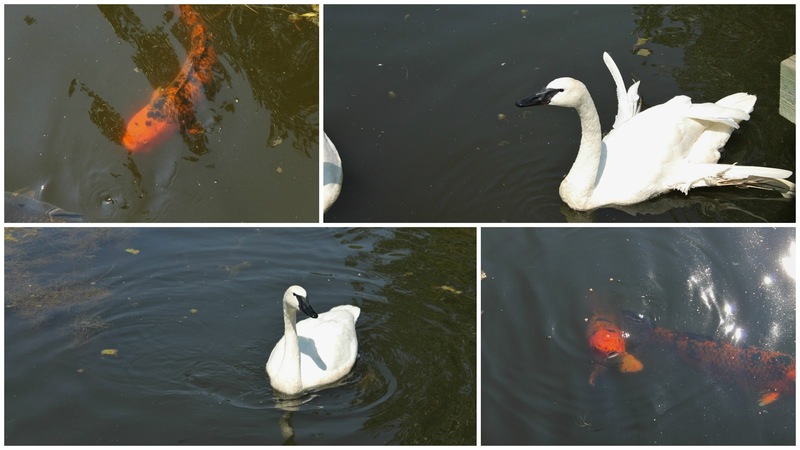 One of the swan's wings were damaged. 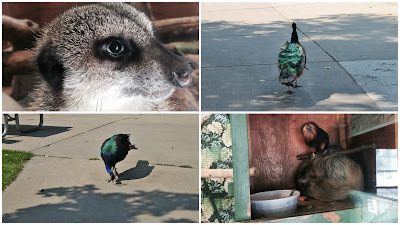 We even got to see a baby peacock. As we were setting up camp we noticed our neighbors van had an advertisement for dog grooming on it and with our dog looking pretty shaggy we figured we should get to know her. Peggy, works about a mile away from the campgrounds, so it was very convenient. She did a great job on Mielikki. We also discovered that she is a Zonologist. What is Zonology you ask? It is a form of energy healing that focuses on the signal system (kinda like reflexology does) in the foot, face or back. Nancy was very intrigued so we swapped a Reiki session for a Zonology session. Nancy had her back done and found it to be very relaxing. We then did a Reiki session for Peggy. We just never know what we will come across. ~ Invest in a small spiral notebook. Nancy uses one to keep us organized. She records the name, address and phone number of the campgrounds we have booked. Also, the nightly cost, what type of hook ups we have, pull through or back in site, if it's Good Sam or Passport America, names of the owners, if payment is cash, check or credit card. That way there are no surprises when we pull in. It is also a great place to list any area attractions that we want to see, how far from camp they are, and if there is a cost to get in. That way we don't forget anything and can plan our daily trips in the most gas effective route.